Eight years later, this pub with good grub (hence ‘gastropub’ based on the UK term for these sorts of places) seems to be going strong. For one thing, it’s packed at my every visit. And for another, seems to be delving into interesting new projects — one of which is brewing beer. On offer one night, under the ‘Stock Pot Ales’ banner, was the Eddie Double D IPA, a dark, frothy-headed beer served really cold. Once warmed up a bit its smell was full and malty, the taste bitter but with a pleasantly sweet linger. It went really well with the ribeye, and every guy in the place — there was an inordinately large number of guys — seemed to have ordered the combo. My final visit I came alone. And the place was packed with groups of guys. “I’ll put you on the quiet side,” my server suggested and I was led to the left, away from the main dining room, to where a smaller lounge area shares space with fewer tables. Two more foursomes of fellas there, but nothing I couldn’t handle. “Can I bring you today’s Globe and Mail?” I declined the offer, but it was a kind one, and thoughtful, and that sums up service here, led by the charming Shane Waldron. The kitchen is helmed by co-owner Chris Deraiche. Deraiche opened The Wellington Gastropub with a commitment to changing its menu daily, and it carries on with that duty, which makes The Wellie something of a rare bird in this town. Not many places take on the creative freedom (and rigours) of a daily menu, or do so with as much success. It also means that what I report I ate you likely won’t. Though there are some patterns that you can count on: always a strong vegetarian dish, a really good steak, usually some winning way with scallops, and reliably great bowl of ice creams to end. 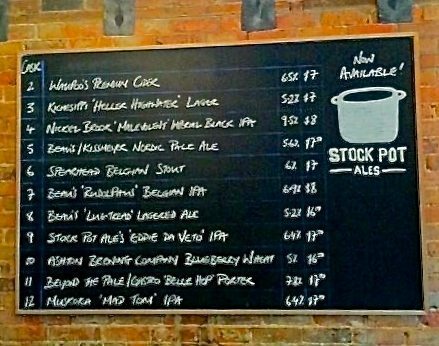 The wine list, curated by Waldron, is a reliable pleasure and if beer’s the thing, there are the Stock Pot Ales to try out. The hard-to-resist-ribeye on a cold March night was a great steak — rich and beefy, seared and red, with enough fat marbling for flavour, and with the added pleasure of a rich and buttery miso hollandaise. The meat came with roasted carrots and a light and fluffy scallion pancake, studded with corn. The risotto we ordered was perfectly judged — that is to say, saucy, creamy, nutty, and still with bite, with Le Coprin mushrooms, overnight tomatoes and a sparkling salsa verde for acidic relief. A month later, those tomatoes and signature salsa verde appear again (hurray!) — in a sparkling crudo and in a rich dish of shrimp and grits. The crudo introduced (to me) a fish called Cobia, (though it has a number of aliases — ling or lemonfish, apparently, or black kingfish or black salmon — so who knows if I’ve met it before). The white fish was firm, dense, served sashimi style, topped with those slow roasted tomatoes and a corn relish. Dehydrated black olives gave the dish some salty pungency, and a judiciously applied vanilla oil perfumed it beautifully. Southern fried shrimp were standing in their crunchy coats, impaled on a bed of gritty, spicy polenta, buttery and very rich. Toasted almonds lent more crunch, and the green relief came with the salsa verde. 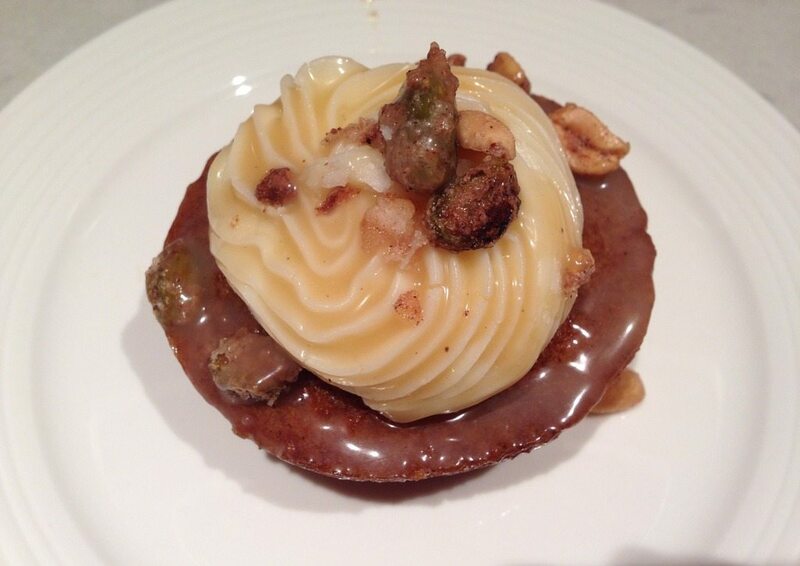 Great carrot cake, presented as a cupcake with a swirl of cream cheese icing, a brown sugar glaze, and candied pistachios. I can also recommend Adrianna’s ice creams as another fine way to end things. The Wellie is now well entrenched in its ‘hood, and certainly worthy enough to pull in from across town. Its team knows its business and that’s apparent from the greeting to the bill. It will be fun to see what this place brews up next.